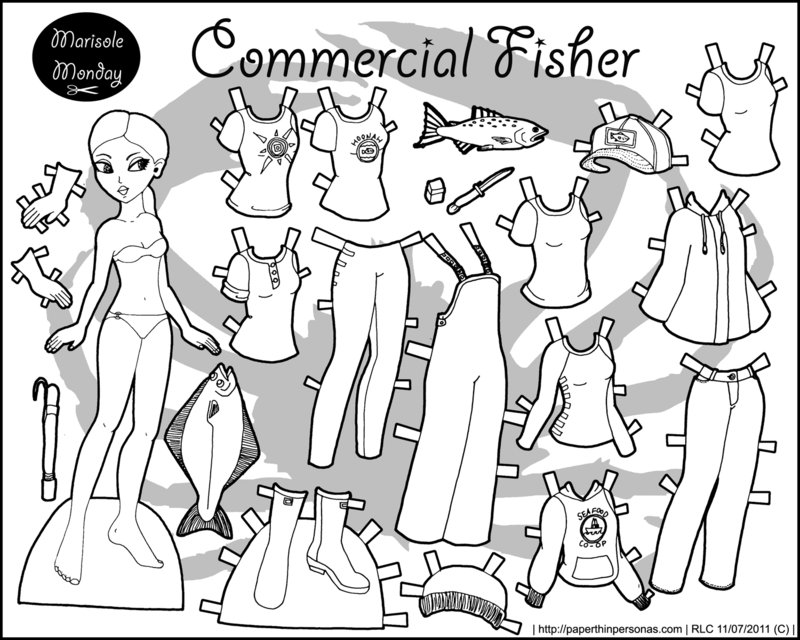 Whenever I meet young girls and ask them about paper dolls, which I confess I don’t do very often, they seem to often ask for Princesses. 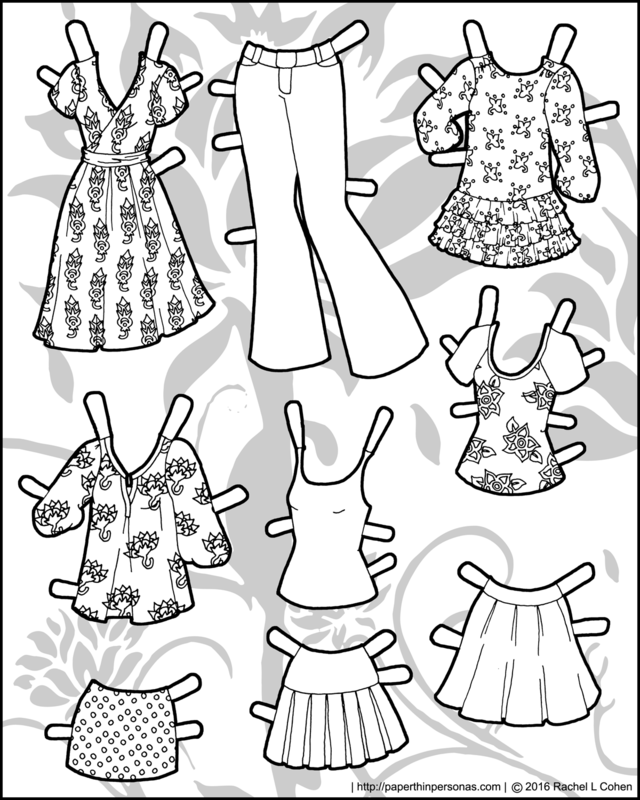 I don’t know what it is about paper doll princesses, but it seems to be a popular trend. As a child some of my favorite paper dolls were those of Peck-Grande which featured beautiful fairytale paper dolls with fantastic dresses (Here’s some images from their Beauty and the Beast paper doll or Sleeping Beauty paper doll). As far as I can tell, princess seems to translate to “amazing over the top gowns” and that works for me. 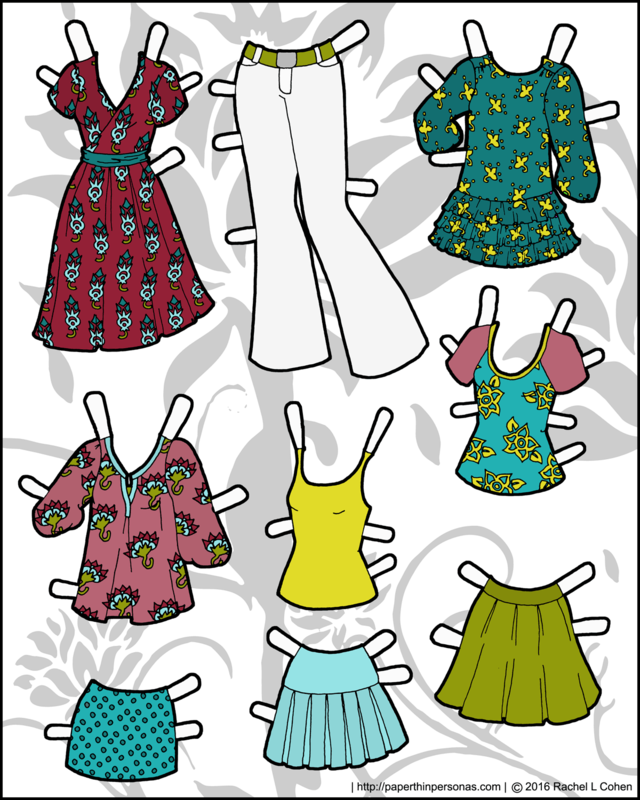 When I design complex patterns for paper doll clothing, I like to try to keep the outfits themselves fairly simple. I think it is easy to get the pattern “lost” in the lines needed for pleats and folds. So, when I decided I wanted to play around with complex patterns for these gowns, it wasn’t a hard decision to know that I needed a simpler silhouette. Early Italian renaissance dresses (from about the 1490s) have always had a soft place in my heart. Someday I do want to do an actual “historical” paper doll from this period, but until then, I had fun playing with the silhouette in this paper doll princess set. These styles might look familiar if you remember Her Ladyship from 2014, she was inspired by the same time period. The model for today’s gowns is Monica. 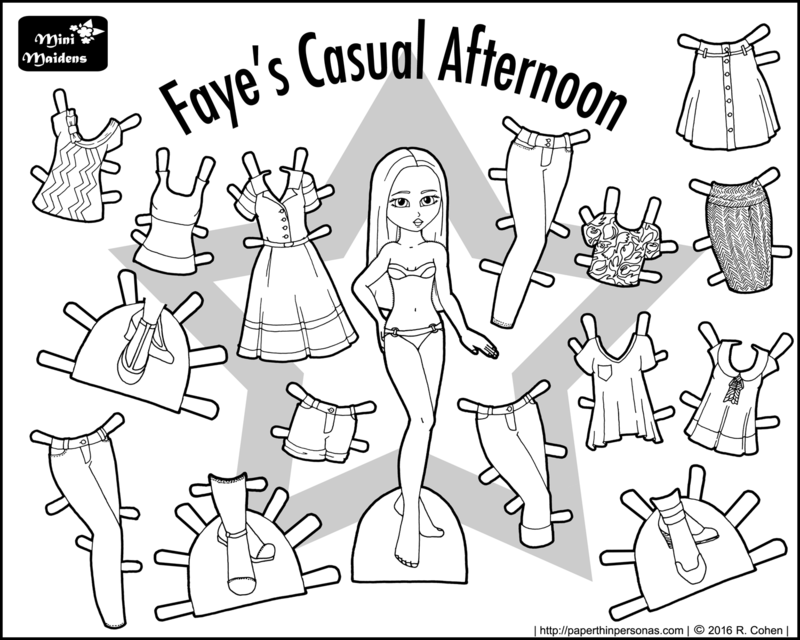 You can find more paper dolls featuring her here. Confusion about which Marisole Monday & Friend’s paper doll model is which? I wrote a guide a few months ago. 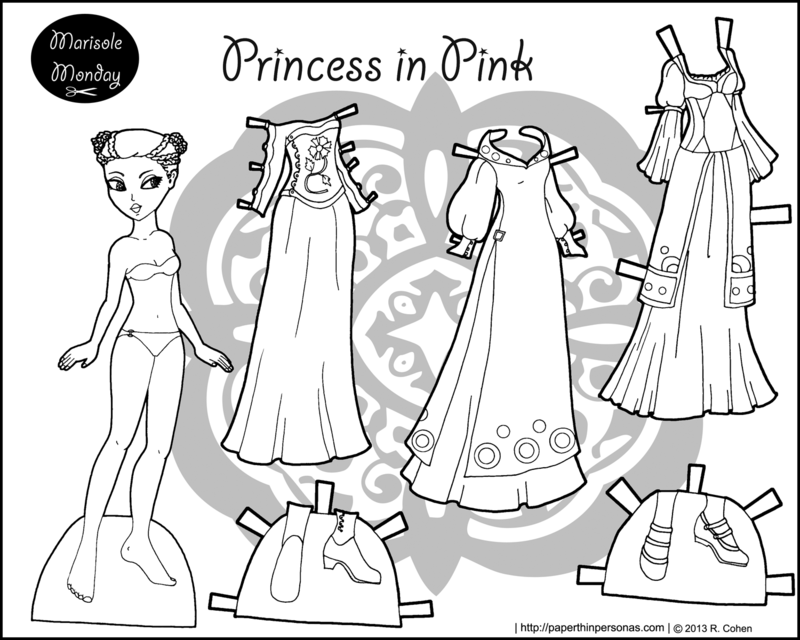 Every time I design a princess paper doll download with these sorts of elaborate patterned fantasy gowns, I swear that I won’t do it again and then I do. Insanity is doing the same thing over again, expecting different results, they say, but here I found myself once more painstakingly coloring an insanely complex pattern and grumbling about it. My original plan was to go very traditional with the colors here. In the actual Renaissance, the expense of dye meant that darker colors were more fashionable and expensive than lighter colors. So, that was my first plan- black, red and gold would have abounded. But then I realized that if I was going to use a dark brown skin-tone for the doll (which was my plan all along) and then went black and red with the clothing, it was going to be a really dark paper doll set. Plus dark colors on these kinda elaborately patterned outfits obscures the black line-work. I spent to darn long coloring this to obscure the nuances of those patterns. So, gold, red and black when out the window for rose, lime and teal. Nothing says spring to me like rose, teal and lime. Plus, I think the brighter spring colors are nice for a May set. It’s spring here in Alabama, after all. 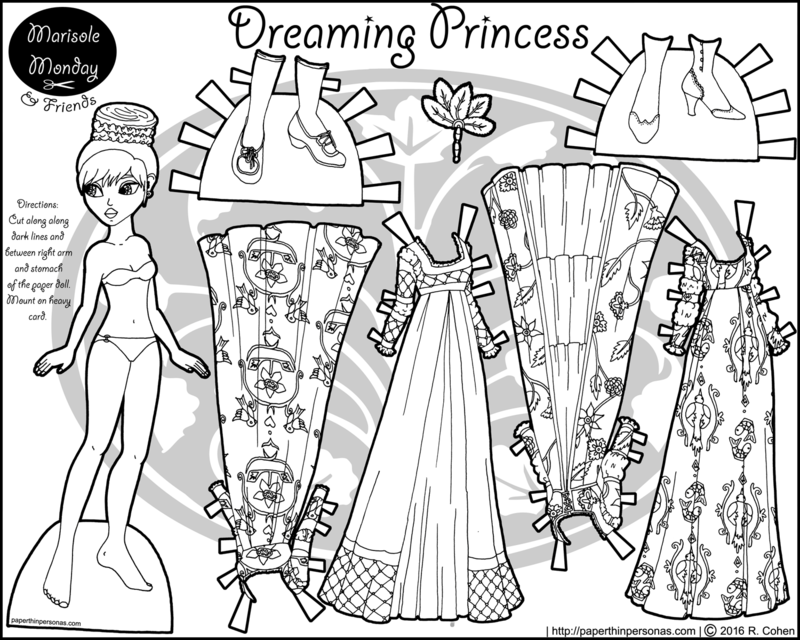 If today’s Monica princess color page needs some friends or more dresses, there’s literally dozens of options, but I think A Noble Lady, Pattern & Grace, Queen of Dusk and Book Loving Princess all make nice accompanying black and white paper doll sets as they are in a similar silhouette. 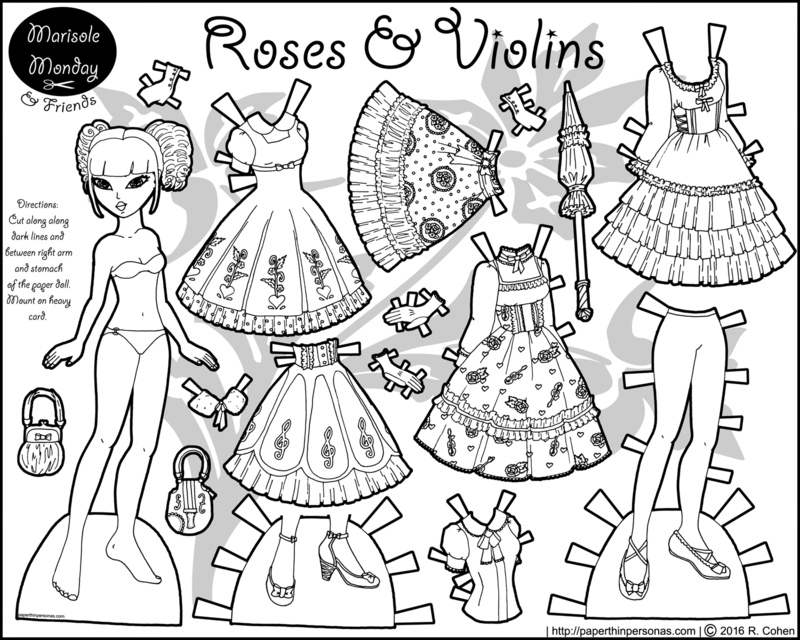 Of course, there’s nothing wrong with deciding today’s Monica freelances as a circus performer or pirate, but I thought if people wanted more “princessy” looks than the four paper doll sets I mentioned above would work well. As many of you know, versatility is very important to me in my paper doll related activities, so I try to point out where one set might interrelate to another set. After all, I don’t expect y’all to keep track of the 500 paper dolls on the site, especially since I can’t always keep track of them myself. One of the challenges of the Poppets is coming up with ideas, because contemporary children’s clothing is strangely the same as contemporary adult clothing, just shrunk down. (I could go into a while childhood studies discussion of this, but let’s not.) I however think that kids should look like kids, not like mini-adults and therefore I tend towards old-fashioned kids clothing. 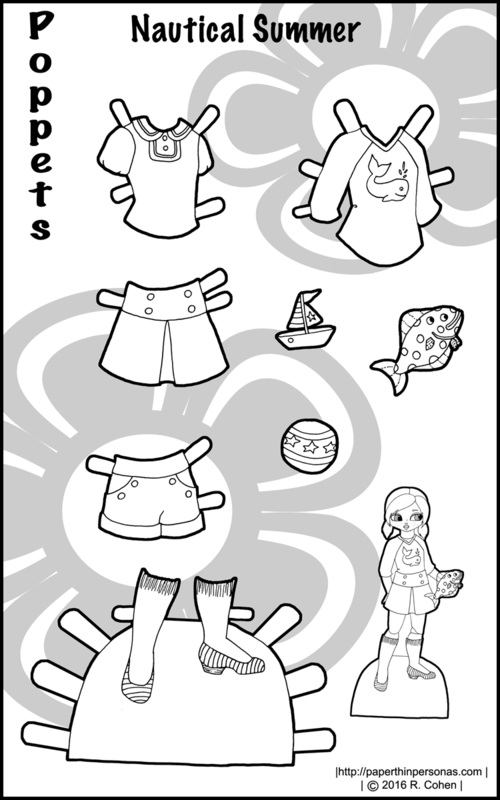 The Poppets, being children’s dolls, also get semi-old fashioned kids clothes. What can I say? My paper doll clothing tends to reflect my interests. Something about warm weather always gets me thinking about the seashore. Today it was 80 degrees outside! Spring has come to Alabama and while I don’t dislike winter, I love Spring and Fall in my adopted state. It’s warm enough to go outside without a jacket and not yet so warm that I don’t want to go outside, becuase it’s over 90 degrees and 80% humidity. 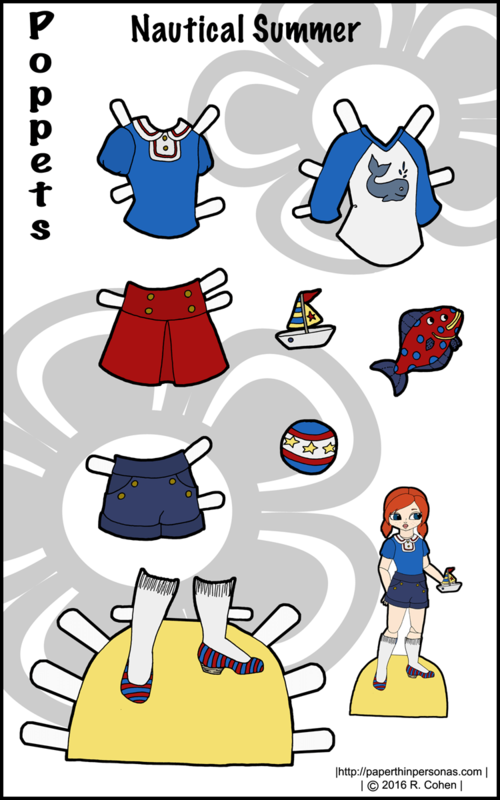 In honor of Spring, I decided to post nautical paper doll clothing. Of course, by the time I was done it looked a lot different than the one on the fabric, but that was my inspiration for the top. So, I was trying to print some of these out to send to a friend and I discovered that on a Windows machine, Adobe’s fit to page works totally different than on a Mac. I couldn’t just move the image over to fit in the printable space. It was very annoying. Since these guys are sized to print out as a half page, because I originally conceived of one day putting them into booklet format, the placement of the image really does matter. To fix this problem, I stick a one inch white border around the PDF. If you’ve always been printing them as a 5 by 8, this might not matter. However, if you have been printing them as a larger scale, this might matter for fit purposes. Let me know if anyone hates this and I’ll decide if I can come up with a better solution that doesn’t require me re-doing the whole series. Allow me to be blunt, I am not one of those people who gets upset about skimpy lady armor. I am far too big of a fan of Xena and Hercules for that, but I think there is a place in my fantasy world for skimpy armor and there is a place in my fantasy world for practical armor and mostly there is a place for stuff that falls in-between. 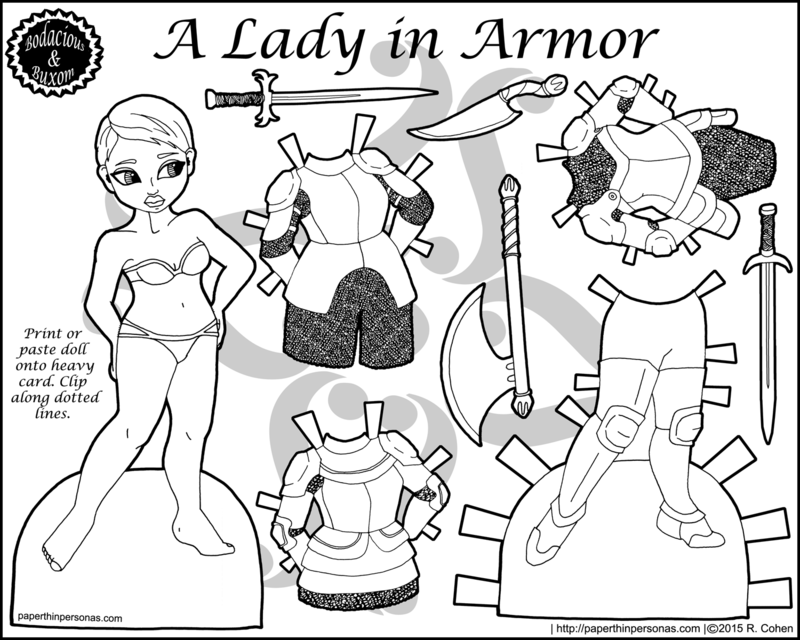 Today’s paper doll is a female knight whose armor falls more into the practical camp than the skimpy armor camp. But don’t worry skimpy armor fans, I’ve got a B&B set planned that falls into that camp, too. I knew I was going to give my female knight short hair from the beginning, but that was because I originally had conceptions of drawing a helmet. Well, helmets are HARD, so instead we have her without a helmet, but with short hair. 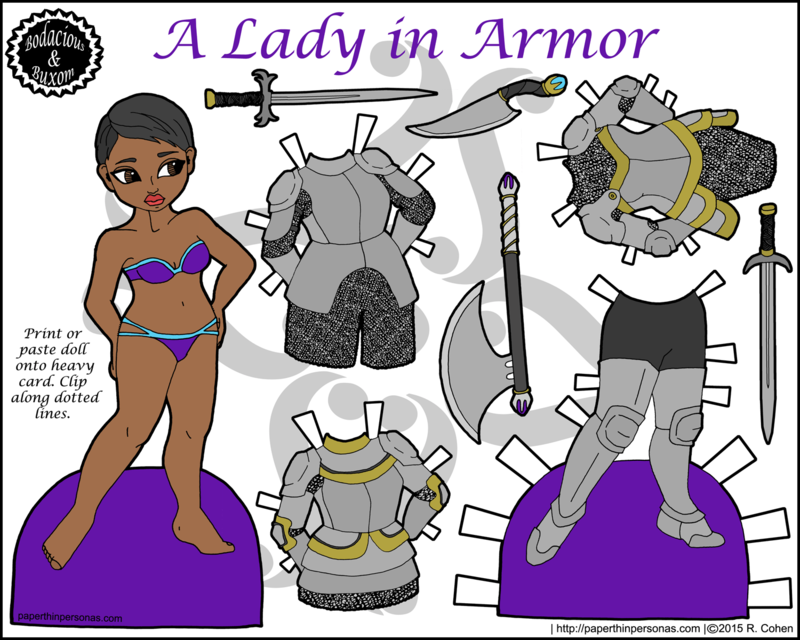 Actually, I think the paper doll, if not her clothing, could easily hop into the modern era and be a young stylish Black woman in 2016, but right she’s being a young stylish knight. One of the reasons I like armor sets is that coloring them is really fast. I mean, armor is silver. That’s it. Done. Uncreative, well, perhaps, but still I like my projects simple and straight forward. Over the years, I have always struggled with chainmail. I think this chainmail is slightly better than some, but I worry its too obvious where I patched together my swatches of tiny circles. Also, is it chainmail, chainmaile, chain mail or chain maile? Does anyone know? That has been bothering me as I write up this post. Anyway, happy Friday, y’all. Have a safe wonderful weekend.